“I’m a somewhat reclusive person I suppose. 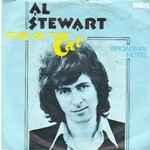 I don’t mix very much with the music business or anyone in it,” Al Stewart once said in an interview with Q magazine. “When I’ve finished a tour it’s almost like I crawl back into a dark corner. In recent years I could have died or moved to Zanzibar as far as the world is concerned.” Al’s signature tune was 1977’s Year of the Cat, but different sources will tell different stories and they probably all play a part as a few different scenarios inspired the song. Al was born in Glasgow in 1945 and moved a few times eventually ending up in Bournemouth via Warwickshire. He decided when he was nine years old that he wanted to make music and record for the same label as Lonnie Donegan. When he announced this to his parents, they were quite startled. “I left school just when the Beatles broke and Love Me Do was released. I was 17 and joined a band called The Sabres as lead guitarist for three months.” The lead singer with that band was Tony Blackburn. He embarked on a solo career in 1967 with his debut album Bedsitter Images which allegedly sold less than 500 copies. He followed in a couple of years later Love Chronicles which was well received and many critics favouring the title track which was an autobiography of Al’s sexual prowess. The track featured Richard Thompson and Jimmy Page on guitar, but the 18-minute epic, in certain circles, is best remembered for being the first ever commercial release to use the f-word. In 1970, he released his third album, Zero She Flies, and became his first chart album in the UK where it crept to number 40. That same year he and his friend (Jethro Tull’s) Ian Anderson headed to the town of Pilton in Somerset where the first ever Glastonbury festival was taking place and he managed to blag a slot playing to a field of about 1000 hippies. Al really made his name with the 1976 album Year of the Cat. The title track became the first of five American hit singles and his only UK entry the following year. Despite only reaching number 31 here, it got, and still gets extensive airplay on the few radio stations who are not restricted to playing the same 50-odd songs, telling us how they’re playing today’s better music mix! He wasn’t overly happy with the Hancock-inspired words, and he didn’t want to take advantage of the man’s tragic circumstances so he gave up on. Also, he figured it wouldn’t work in the States as no one in America had heard of him.” Hancock killed himself in 1968 by taking a drug overdose. Al says the final version of the song is about a love affair taking place in North Africa and the 1942 film Casablanca was also an inspiration, hence the opening line, ‘On a morning from a Bogart movie in a country where they turn back time.’ In his mind he headed off to Morocco and when he arrived they crowded about 25 people in the back of this bus. One of the guys gets off in this little medium sized North African town and decides that he’s going to leave the rest of the party and walk around the bazaar, because he might see more that way. At the bazaar this girl comes up to him in this long flowing robe with sunlight bouncing off it in all directions and says, ‘Hey man, you know what year it is?’ He says, ‘No, I don’t know. I just don’t know. What year is it?’ She says, ‘Come back with me and I’ll tell you all about it.’ So she takes him back to her bivouac for the night and when he wakes up it’s already afternoon and the bus is gone and all the other 24 people have gone with it. So he’s stranded there with just this strange girl. She lights a couple of joss sticks and makes him some tea, and eventually he gets used to the idea that he’s got to stay there for a while, because he’s got no money, so he sits down and he thinks, Well, if God intended me to be here, there’s nothing I can do about it, I’ve got to make the most of it, I won’t attempt to get away, and just for this year, I’ll stay with this girl and see what we can do. See how we can work it out. This is what Al called his North African love song. The album was recorded at Abbey Road Studios with engineer and producer Alan Parsons who had recently worked on Pink Floyd’s Dark Side of the Moon. There was also a rumour at the time that Parsons played the sax solo on Year of the Cat, but that’s not true, that honour went to Phil Kenzie who also played on The Eagles’ The Long Run on the Eagles live album and on Poco’s 1979 American hit Heart of the Night.